I would like to take this opportunity to welcome you to the AA Africa family! We are committed to providing you with an experience of a lifetime, while discovering Tanzania Game Parks. I invite you to see wildlife in its natural habitat, unique and beautiful landscapes and a rich, cultural diversity. In addition to our exceptional wildlife, Tanzania is also home to more than 130 tribes, originating from four ethnic groups. I would be very pleased if you would give us the opportunity to serve you with our more than a decade of experience in this industry. We'll provide you the best opportunity to get the best possible images from many different behaviors and interactions of our game animals, birds, reptiles, insects, vegetation and people. Tanzania has more than 310 species of mammals, 245 species of reptiles and more than 1,080 species of birds. My field team of Naturalists and Guides will also provide you with the new and exciting experience of interacting with the local people and learning about their lifestyle. Our safaris are more than just “game viewing”. We go the extra mile to show you the real Tanzanian people, through visits to villages, schools, markets, hospitals, and churches just to mention a few! I know each one of you have your own interests and expectations. Please let us know when you are booking your trip so that we can customize your adventure to suit not only your desire but also to make it educational, fun and enjoyable. I look forward to getting an opportunity to serve you and WE SHALL TAKE YOU, TO THE RIGHT PLACE AT THE RIGHT TIME! Augustine Minja, a native Tanzanian, was born in 1972 at the foot of Mount Kilimanjaro in Northern Tanzania. He received his Secondary School and High School education in Western Tanzania near Lake Tanganyika where he majored in English and French languages. He visited the Ngorongoro Crater for the first time when he was in Secondary School and was amazed and touched with the abundance and diversity of game animals, birds and different plants he saw. After this trip he developed an ambition of becoming a Naturalist Guide. In 1995, Augustine’s ambition to be a Naturalist came true when he joined the prestigious, College of African Wildlife Management-Mweka for Wildlife Management studies and specializing in Tour Guiding & Visitors Service, which he graduated from in 1997. Upon graduation, he joined the Largest Safari Company in Tanzania as a bilingual Naturalist and Tour Leader, leading and guiding various safari Groups, including those from Indianapolis zoo, Oregon Zoo, Sacramento Zoo, Santa Anna Zoo, Reid Park Zoo, Birmingham Zoo, Zoo North West-Pensacola, Capron Park Zoo, Dallas Zoo, Houston Zoo, Memphis Zoo, The National Zoo, Lincoln Children Zoo, Maine Audubon Society, Mass Audubon Society, Albuquerque Museum, Cleveland Museum of Natural History, Harvard University, University of California (Berkley), William & Marry University, Washington & Lee University, University of Indiana, University of Virginia, and hundreds of other private groups and families, including American Actress and Singer Michele Lee. In September 2005 Augustine attended The American Zoo and Aquariums (AZA) conference in Chicago–USA where he was the guest speaker for an American Tour Company where he was working for and spoke about tourism attractions and Wildlife Conservation in East Africa. He also spoke to Indianapolis Zoo, Oregon Zoo, Sacramento Zoo, Santa Anna Zoo, Reid Park Zoo, Birmingham Zoo, Zoo North West-Pensacola, Capron Park Zoo, Maine Audubon Society, Wetland Institute in New Jersey and University of Arizona about the tourism attractions in East Africa. In his desire to learn more about tourism, Augustine enrolled as a long distance learner with Cambridge International College–UK in 2008 and was awarded a distinction advance diploma in Tourism and Travel Agency Management. In 2009, Augustine founded his own Tour Company, Augustine’s Adventure Africa (AA Africa), which specializes in conducting private, custom-made Adventure Safaris in Tanzania with extension to Zanzibar. His wife Eva holds an Accounting Degree from Arusha Institute of Accounting and she is Director of Accounts and Reservations. Augustine and Eva are blessed with two sons and a daughter. Augustine still leads some of his groups as a Naturalist. 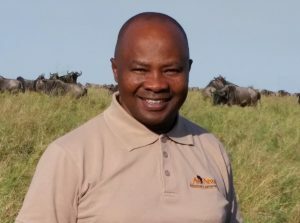 His 20 years of experience, flexibility and broad knowledge of wildlife and native culture combine to create the ultimate safari experience. Augustine spends his free time reading wildlife ecology, research journals and papers, biographies of great leaders, wildlife photography, watching soccer and listening to African rumba music. It is not yet late for you – safari with Augustine and his team and discover, explore and appreciate what the Tanzania wilderness has to offer!